Victoria, Mahe (Seychelles) – January 29, 2018 (travelindex.com) – January 2018 is coming to a close. It has brought troubling announcements for loyal and dedicated staff of the Seychelles National Airline and also for the tourism industry as a whole. Last week, Air Seychelles held a high-profile press conference to announce their future plans to the world. A “new strategic transformation plan aimed at ensuring the long-term profitability and sustainability for the airline” was announced. Issues being raised by everyone following this press conference include the loss of jobs by hard working Seychellois who had forged a career through their National Airline, and how this decision will affect the Seychelles tourism industry. It was only a couple of years ago that Seychelles embarked on restructuring its national airline. This was followed by a period of uncertainty for all its employees. Reports issued year after year since then only reassured the country and all the airline’s staff that all was going well. This was further confirmed by the decision to expand routes. Today, all seems to be in disarray. Staff members are disillusioned and angry because anticipated redundancies will come at a time when Seychelles will not be seeing any new tourism establishment openings. Dispassionate meetings with staff members have already commenced, leaving the staff with a sour taste in their mouths. Staff are allegedly being informed of the intention of Management to abolish certain posts held by Seychellois and to create larger positions, which will be occupied by new imports. All of the above is happening right under the noses of the Government and the ever-watchful National Assembly. Seychelles as a tourism destination has France as a key tourism source market. The local tourism trade has invested heavily in this market since the 70s. Air Seychelles is the only airline offering direct non-stop service to Paris and this will now stop. The French Travel Trade partners are all friends of the Islands and depend on our Creole Spirit to lure tourists to our sandy shores. Seychelles has been bragging about its tourism yield, but recent changes threaten to undermine our continued success in the field of tourism; today our Air Seychelles will concede the Paris – Seychelles route to the low-cost subsidiary carrier of Air France “JOON”. 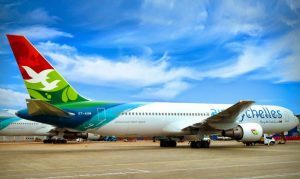 No competition could match a National Airline with one of the best scheduled flight departure and arrival slots, and a non-stop service with the Islands’ Seychellois Creole staff caring for their passengers on board. The “JOON” of Air France will be the only other direct non-stop service, and we are throwing in the towel even before they start their operation. Air Seychelles will be suspending its Paris service effective 24th April 2018, and it is confirmed that this refocusing of the business will include a reduced workforce in cabin crew and pilots, as well as supporting flight and commercial roles. We must encourage Seychellois to further invest in their tourism industry and to be implicated in everything that is tourism-related. This includes its aviation sector. Air Seychelles belongs to Seychelles and it was created many moons ago to be the insurance policy for our fragile tourism industry. The Government as the major shareholder of the airline must stand up for all the Seychellois who will be laid off, and the elected representatives must sit up and take notice; they must speak up to avoid the laying off of qualified and capable young men and women who have made their career in Air Seychelles. We today cannot and should not let them down. Duty of care has been displayed by the British Foreign Office when they issued a warning to those travelling to Seychelles. This worrying Travel Advisory republished by TravelMole this week should raise many an eyebrow. Although notable and commendable efforts are being undertaken by the relevant authorities to stem the influx of petty robberies plaguing our Island Nation, the follow-on effects from continued crime include negative publicity for Seychelles in the world of tourism.